The previous move (Black 231) was a horrible mistake. Note: White had to play a big sente yose move at a. It was urgent. White misses a chance here. White 1: Cuts off the black stones from the main sources. Black 2: Threatens to connect. If Black does not make this move then White will end the cut-off with sente. White 3: Finishes the cut-off. 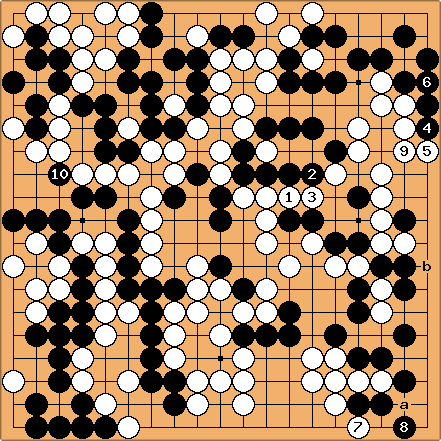 Black 4: A good yose move, reducing White's territory in sente. White 5: Putting two black stones into atari, White stops Black here. Black 6: Naturally connects. Black does not lose sente here. White 7: Fighting for the initiative. It seems to White that two stones at the bottom give more points than the entire right side territory. White does not win anything with this move however. Black 8: Defends two stones. Usually I prefer a solid connection at 2 in such situations as it leaves fewer ko-threats. White 9: Defends a small territory on the right side. Black 10: A threat to cut.